Curries are always a delicious dish. Everyone loves a spicy meal, especially on a cold, winter night. And there is no reason why you can’t enjoy a lovely curry just because you have a gluten allergy. Of course you will have to avoid certain ingredients but you can still cook up a fabulous spicy meal. Coconut-based curries are a nice alternative to the very spicy ones. The coconut milk adds a creamy texture to the meal and also cools it a little. Some people don’t like their curries too spicy so if you want to cook a curry at a dinner party a coconut based one is always a safe choice. This delicious vegetable curry uses coconut milk and since it contains no meat it’s also a great meal to serve to vegetarians. This curry will serve two people as a main meal but if you serve it with lots of rice and gluten free bread it'll stretch to four. Start by chopping the onion, chilli, peppers and courgette and set aside. Peel and wash the potatoes and cut into cubes. Next melt the butter in the saucepan. Keep it on a low heat until the butter melts. If you have the heat two high the butter will sizzle. Once the butter is melted add the chopped onion, chilli, garlic and the ginger to the pan and cook over a low heat for about five or six minutes until the onions and pepper start to soften. Add the cinnamon to the pan and stir in. Cook for a couple of minutes, stirring continuously. Next stir in the coconut milk and the lemon juice. Stir and cook for a further 15 minutes. Keep on a low heat so that the coconut milk is simmering but not bubbling too much. Do not boil the mixture. Stir occasionally to make sure it does not start to stick. Add the potatoes and the rest of the vegetables to the pan and stir. Cook for another 15 minutes or so. You want to get the vegetables nice and soft so try them after 15 minutes and if they are not soft enough for you then cook for a further five minutes or so. Everyone likes their vegetables different so it is really just up to you to decide how soft they need to be and when they will be ready. 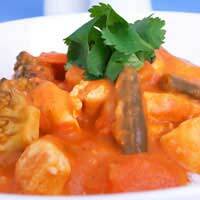 Once the vegetables are at the required softness add the coconut cream. Stir into the curry and then simmer for a couple of minutes. Serve the curry piping hot with gluten free bread. You can buy this at many supermarkets but always check the label to make sure it is in fact gluten free and if you are not sure then you should call the manufacturer. You’ll find the number on the product packaging.